With thousands of incredible creative works uploaded daily by our community of millions, we help visitors discover some of the most exciting and innovative work by offering great filtering tools (by tool, location, even color!) 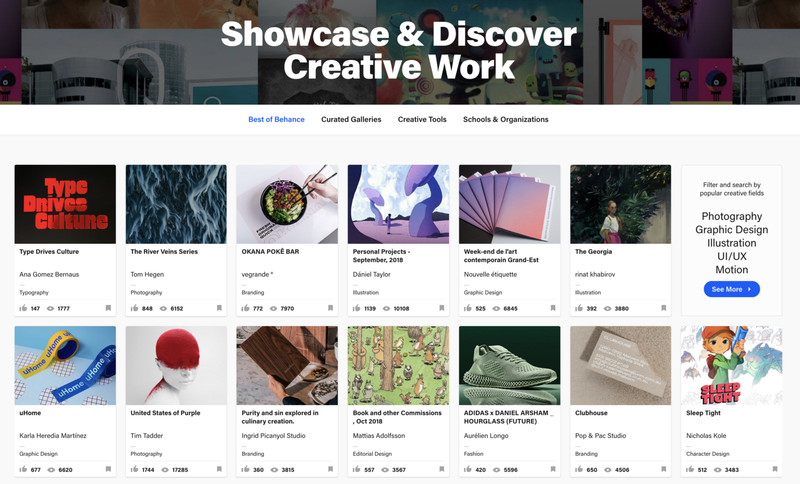 as well as offering a hand-picked, curated gallery of work uploaded daily — our featured galleries — both on the main Behance gallery and within the industry specific Served Sites. Every project published is eligible to be featured on Behance and/or any of our Curated Galleries. Behance’s Curators are trying to expose especially innovative and well-crafted work. They consider all sorts of factors when reviewing a project, including quality and originality of work, presentation of the project, context of the project and the traction it is getting in the community (appreciations, comments, etc…). Generally, projects should have 6–20 images without repetition. It’s rare to see a Featured Project with just 1 or 2 images in it. If your project is showcasing a single piece of work — say, a mural — it’s important to show detailed view of this piece to create more content for the project. Make sure your project is on the larger size, ideally around 1400 pixels. Our curators look out for good quality and resolution, and a consistent image width throughout the project. We find that watermarks and other ownership marks distract from the media in a project, so we would warn against including these in your project. Many people publish partially completed projects, and then finish them later on. Because our curators can’t look at a project each time that it is edited, we suggest only publishing projects when they’re ready to be considered for the Featured Gallery. 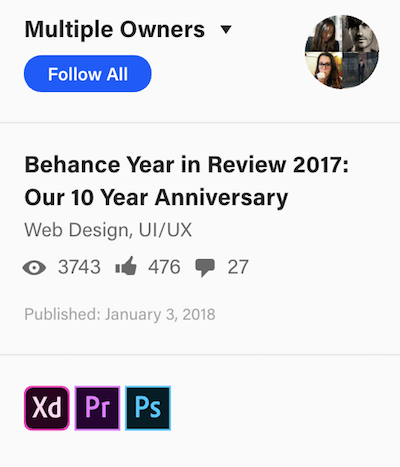 Many people use Behance to publish Work In Progress, and then get feedback. This is fine! But for the greatest chance of getting featured, we suggest creating a totally new project once you’ve taken your edited based on your feedback. You will be able to add a link in the final published project to your Work In Progress, allowing people to view the evolution of your work. An example of a given day’s “Best of Behance” page. The cover image is the face of your project. It’s the first thing people see when they encounter your work, so it’s your best opportunity to invite people to take a closer look. When choosing a cover, select an image that highlights the look and feel of the project. The cover needs to be appealing –it should make people want to click to see more– but it also needs to be a solid representation of the project. If it’s a great image but doesn’t translate what’s inside, people may be disappointed when they get to the main content. Stay visual. You have plenty of opportunities to explain your project in words with the description and fields, there’s no need to add text to the cover image. Consider including a full size version of your cover inside the project. If people love the cover, they’ll want to get the chance to examine the whole thing. For motion graphics, especially in ads, choose a screencapture that showcases the narrative of the piece. When choosing the Creative Fields for a project, select the creative field that represents your role, not necessarily the work as a whole. If your project is a short film, and your role was in sound design, make sure you select Sound Design, not just Film in general, as the creative field. This is the opportunity to highlight the specific work you did. More than 60 Creative Fields are available on Behance — and we’re always adding more! Take the time to explain your work: Why did you create this work? How did it come together? What does it mean? In some creative fields, explaining your work can be just as important as the work itself. Take the time to tell the story and process behind the piece. Don’t hesitate to use the Project Description to easily say more about your work! Tags help your work to be found. 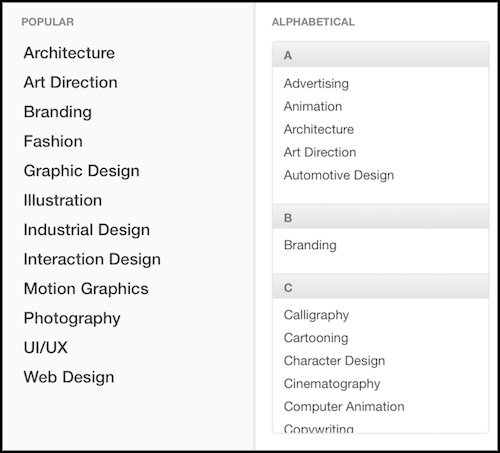 Including a few tags regarding genre, technique, theme or other elements will ensure it pops up in the right searches. Add credits or co-ownership for other members of your crew to make your project even more connected. Tools allow visitors of your project to learn more about your creation process and categorize your work even more! Use Behance to showcase and discover creative work. We're on a mission to empower the creative world to make ideas happen.